Following a comprehensive eye exam, additional investigative tests may be recommended if there are any irregularities in your eye health or vision. This includes photographic documentation, visual field studies or in depth glaucoma evaluation. The tests described below are some of what can be expected. Validated by decades of research and clinical experience, HFA is the accepted standard of care in glaucoma diagnosis and management. With HFA we feel confident we’re providing the best possible care for our patients. Glaucoma Progression Analysis software provides advanced, accurate progression analysis for better glaucoma management. It helps quantify the likelihood of progression and identify high-risk patients. 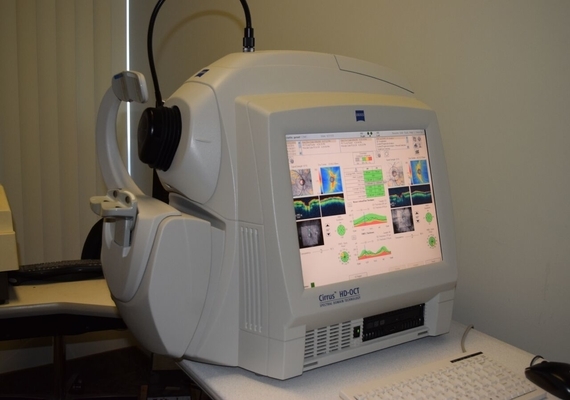 Optical Coherence Tomography (OCT) is a non-invasive imaging test that uses light waves to take high resolution cross-section pictures of your retina. This allows your optometrist to map and measure the thickness of each distinct layer of the retina, allow superior visualization of these structures. These measurements aid in the diagnosis and management of ocular disease such as glaucoma, age-related macular degeneration (ARMD), diabetic eye disease and other retinal pathology. 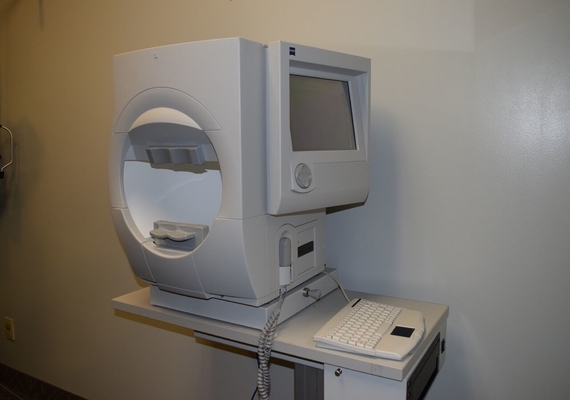 The test is painless and may require pupil dilation for best imaging results. OCT is an essential tool and the standard of care for glaucoma detection and management. Your optometrist highly recommends an OCT scan if there a family history or signs of glaucoma, ARMD, epi-retinal membranes, diabetic macular edema or other macular conditions. Digital Retinal Camera technology is particularly important to detect and monitor health of the retina. Often, we find things with this technology that might not be detected using more traditional examination methods. As well, it provides a permanent record of the condition of the retina so that small changes over time can be detected. The Digital Retinal Camera in our office is at the forefront in detecting changes at the macula, optic nerve and within the vessel arcade. It is particularly good at finding subtle changes at the retinal level for macular degeneration, diabetes, hypertension and glaucoma. Since nothing touches the eye, this test is painless. There are no x-rays involved, so patients can also have the test performed during pregnancy. The test is fast becoming the cornerstone in monitoring ocular health. Your doctor highly recommends the test during your annual examinations, and it is particularly important for people with a history of high blood pressure, diabetes, flashing lights, headaches, retinal disease, or for those with a strong spectacle prescription. A pachymeter is a device that uses ultrasound to determine the thickness of the cornea (the clear tissue in front of the coloured iris). Pachymetry is an essential measurement prior to certain refractive surgical procedures, such as LASIK. A measure of corneal thickness is also important when measuring the pressure inside the eye. If corneal thickness measurements are thicker or thinner than average the intraocular pressure may be overestimated or underestimated. This is very important when following or testing for glaucoma.